easily conﬁgured for your needs, including review content, rating scales, workflows and even report appearance. The EchoSpan development planning module helps employees close the loop on their 360 degree feedback process by enabling employees to create and manage professional development plans based on their review results. I have just recently started using the system and overall, I like it! It has many more features then the old system I used to use. I like that you can upload Targets and Raters into the system without manually entering them (old system I had to!). You should be well versed with some type of 360 Survey administration background to get around and through the system. You have resources if you are having troubles but you really need to figure the system out independently. When you have an issue you need to send an email to the helpdesk. They are responsive and helpful but if you have a big issue it can take a while to explain it by typing your issues and waiting several hours to get an answer. I haven't gotten used to not picking up the phone and calling for help. That part can be a little frustrating especially when you have client's breathing down your neck for an immediate answer. The helpdesk does their best to help and they are always friendly. Really love the flexibility of the report on what you can include. The report is very easy to read overall although I found a few glitches now and again. Once I reached out to the helpdesk they took care of it quickly. I am happy with the new system and look forward to continuing to learn more! I am a confirmed fan. I searched for months for a 360 survey solution that was capable, flexible, and affordable. I found a lot of capability and flexibility out there. Affordability was another matter. Just to get started, I was being told by most vendors, would require $60,000 to $80,000 dollars. After that there's be an additional $60,000 in annual licensing fees. For a survey that would be used regularly but on a limited basis this made no financial sense whatever. Then I came across Echospan. They saved my project.Ours is a special application of the usual 360 degree tool. We aren't using it as a competency survey for individuals. Instead, we have developed a team effectiveness assessment that runs on a 360 platform. Echospan works perfectly for our needs. It's simple, easy to set up and administer and cost effective. Ours is a special application of the usual 360 degree tool. We aren't using it as a competency survey for individuals. Instead, we have developed a team effectiveness assessment that runs on a 360 platform. Echospan works perfectly for our needs. It's simple, easy to set up and administer and cost effective. There are a few limitations especially in formatting of final reports. But, for the flexibility and at the cost I can't complain. I can't say enough good things about the Echospan 360-degree feedback tool! The platform is flexible, intuitive, and easy-to-use. We have been able to configure a variety of custom assessments aligned to our organization's leadership competency model while leveraging the robust content provided by Echospan. The user interface is simple and attractive, and the feedback from our users (primarily senior-level business leaders) has been overwhelmingly positive. In addition, the service we've received from Echospan has been exceptional. Their leadership team was flexible and patient as we worked through the contracting process. Our dedicated support partner is incredibly responsive and thorough in addressing our questions/requests and offering innovative ideas and solutions. Having used Echospan's 360-degree feedback platform across a variety of industries, in public and private sectors, and with organizations large and small, I would confidently recommend it to anyone looking to implement a robust yet cost effective 360-degree assessment program in their organization. Very targeted results helped to identify which competencies were in need of improvement as well as what areas the employee has excelled at.The ease of use. I have had very few questions on how to login and use the software from raters. I like the competency library and the reading suggestions. The ease of use. I have had very few questions on how to login and use the software from raters. I like the competency library and the reading suggestions. The limitation on number of raters when it comes to larger projects. It would be helpful to allow for more than 100 raters without costing per rater and having to add raters through contacting support. We trialed the Echospan software in February 2016 to get a feel for the process and reporting before deciding if we wanted to use it for twenty 360s in March/April. We were quickly elated with the tool as compared to what we were using previously and have also compared it to another tool that one of our clients uses. In fact, even before trialing the software, the demo video, training videos, and the interactive demo with an Echospan representative had already convinced us that we had found something of quality that we were excited to use. I would HIGHLY recommend starting with the videos and a trial (we just ran a fake 360 with one of our colleagues and set a few of us up multiple times as different raters with different working relationships (direct report, supervisor, peer, ...)). This helped us understand how to use a good bit of the tool and see how things showed up in different views of the reporting prior to purchasing. To be honest, however, the tool "had us at hello"; we knew right away that there was no going back. Customer service and the development team have been OUTSTANDING; they've resolved all of our concerns/issues and have answered all of our questions to our great satisfaction both during the trial period and since purchasing. I cannot say enough about how truly impressed we've been with them. We are now in May 2016, just 3 months since finding Echospan, and are working on our 3rd project of running 360s for different clients through the tool, and it just keeps getting better and easier to use. The functionality of the product is outstanding, and we couldn't be happier with it. Below are some frequently asked questions for EchoSpan. Q. What type of pricing plans does EchoSpan offer? Q. Who are the typical users of EchoSpan? Q. What languages does EchoSpan support? Q. Does EchoSpan support mobile devices? Q. 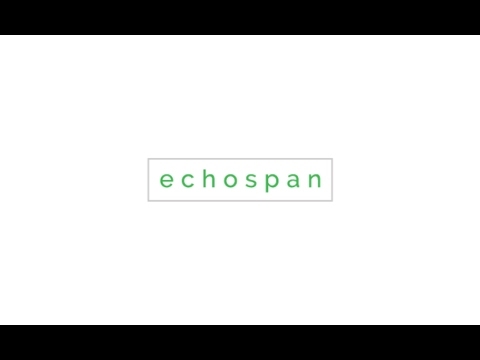 Does EchoSpan offer an API? No, EchoSpan does not have an API available. Q. What other apps does EchoSpan integrate with? Q. What level of support does EchoSpan offer? Q. Which apps is EchoSpan compared to most often?